In this review, I will address the features, the turrets, the usability, the aiming range, the BDC reticle, and the hash marks of the Nikon P-223 3-9×40 riflescope. Eighty three percent of Amazon reviewers give it 5 stars, and there are very few setbacks to the device. Reviewers rave about the generous, consistent eye relief that keeps your forehead from bruising even when the heaviest recoiling lightweight rifles, cartridges, and severe shooting angles threaten. The BDC 600 reticle has been specially developed for the trajectory of the 5.56 NATO round/ 223 Rem with 55 grain polymer-tipped bullet. This reticle provides shooters hash marks from 100-600 yards and open circle aiming points. There are also precise, hand-turnable, zero-reset turrets with positive click adjustments, which help you to zero in sooner and to maintain your setting despite even repeated recoil. Then, the 100-yd. Parallax setting eliminates parallax, improving your aim. Because the scope is O-ring sealed and nitrogen-filled, it functions even in watery and foggy conditions. The scope is 13 in. long. 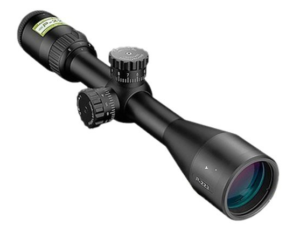 Being uncovered, the turrets are directly accessible, which is highly unusual in scopes at this price range. Most Nikon Prostaff scopes need screw-capped adjustments. Reviewers say the turret adjustments are crisp, and after you have zeroed in the scope, you can turn and lift the turret caps — without having to reset everything — and drop it back into the zero place. So, if they get bumped or turned somehow, all you have to do is return both turrets to zero. You do not need to zero in the scope again. Now is that wonderful or what? Even a handicapped person can use this sturdy, durable, well-constructed scope. The Nikon design is hard to beat. It is nearly as good as a Mark 4 LR/T 4.5-14x50mm or Schmidt Bender 3-12×50 PM II/LP, which both cost about 10 times more. The scope has no caps on it, which is yet another great feature, as you do not need to worry about removing and losing them. Another easy-to-use feature is that after sighting the scope in, all you have to do is to pull out on the turrets and turn them to zero in 6 clicks in either direction without changing the setting. When you adjust the uncovered turrets, the clicks are crisp and easily audible. Each click is a quarter inch at 100 yards. So, as one user says, the lens caps had to go — elastic and all. Lastly, the weight of the scope is quite reasonable. The scope can be zeroed at 100 yards and adjusted out to 800 yards. With this scope, you can consistently hit an 8 inch gong at 800 yards, though, at upper magnification, it gets just barely fuzzy. The clear glass optics are sharp and bright, and only minimal sighting in is needed. Still, zoomed 9 times in low light, the clarity remains amazing. The only problem with the aiming device is that when you are hunting at night when there is snow on the ground and you turn on a red light, the scope draws in so much of it that it causes a halo effect because of the light reflecting off the snow and into the sighting device. In low light situations, though, its drawing of the light is very useful. One user said he could see through the scope on full moon nights to the point that he felt enabled to make a clean shot if needful, and that he had thrown everything he could at this scope and that it still performed perfectly. Up to 300 yards, the picture is clear, and another user reports the scope can reach out to 600 yards, which is the same distance as the marking goes out to. Yet another user reports it very effective for getting a 100 yard zero on a 50 yard target. When he checked it at 100 yards, it was a close thing, and he just had to make one minor adjustment to get it to where he wanted it. The eye relief is constant, and the aim is still accurate. After sighting this scope, you can even reset windage and elevation dials back to zero. This has two pluses and two negatives to it. One positive thing about it is that it does not change a bit during zoom range. The other is that the Spot On technology tells you what each dot means in terms of yardage and zoom settings. However, the reticle only functions correctly at full zoom, and the miniature BDC reticle bubbles look odd. They do not line up when zero adjusting. Nor do they line up perfectly after you zero it and reset the windage and elevation knobs. The BDC dots that indicate yardage are quite small, causing the user to need to adjust the focus at the back of the scope in order to make the reticle show clearly. Then you need to adjust a smidgin to achieve the hold-over indicated by the dots. In addition, the dots are hard to see against a variable pattern or a dark target. It requires concentration to spot them. In this review, I have discussed the features, the turrets, the usability, the aiming range, the BDC reticle, and the hash marks of the Nikon P-223 3-9×40 riflescope. Overall, users love it, but there are just a few minor flaws.